You know that saying about standing on the shoulders of better men? Gloryparis took that extra seriously. 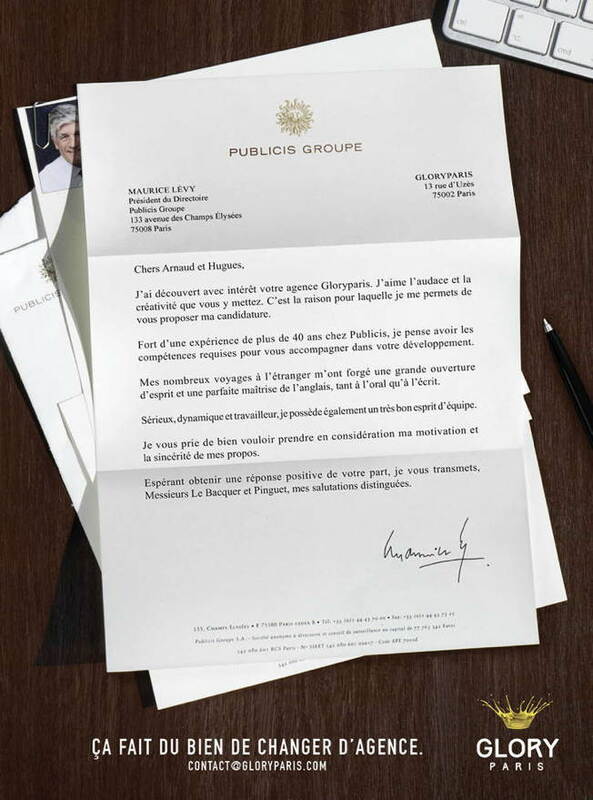 The young independent agency has been doing some inspired self-promotional stunts, and the latest one is particularly cheeky—a print ad that features a drippingly hopeful (fake) cover letter from none other than Maurice Lévy, High King and CEO of Publicis, who pleads for a job at the Paris shop. It is with interest that I discovered your agency Gloryparis. I like the audacity and creativity with which you've launched. This is the reason why I wish to propose my candidature. With the strength of over 40 years of experience at Publicis, I believe I have the competences necessary to accompany you in your development. As someone who's serious, dynamic and hardworking, I possess very good team spirit. I hope you will consider my motivation and the sincerity of my proposal. With hopes of receiving a positive response, I leave you, Monsieurs Le Bacquer and Pinguet, my distinguished salutations. It concludes with the brassy tagline, "It feels good to change agencies," followed by Gloryparis's contact email. The ad says plenty about its creators, industry veterans Hugues Pinguet (ex-Bates, DDB, BETC and Havas 360, among others) and Arnaud Le Bacquer (ex-CLM BBDO, Leo Burnett, Publicis Conseil and Agence H). 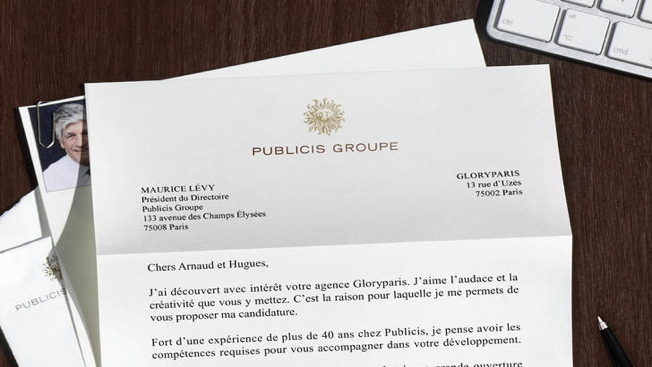 To start with, it lets them express their aspirations through the mouth of a powerful man: Gloryparis is just nine months old, but it's looking to provoke with a kind of hysterical glee (the agency's slogan is "L'audace mène à la gloire," or "Audacity brings glory"). What's more, they aren't afraid of attracting the roving eye of Lévy, which they surely will when using his signature and stationery—the tools that identify the man—as puppets. Lévy, it's been said, has such an iron grip on the culture of his empire that employees who receive his newsletter sometimes tremble with the conviction that he's heard about something they did and is talking directly to them. To want that attention burning into the back of your neck is no small ask. 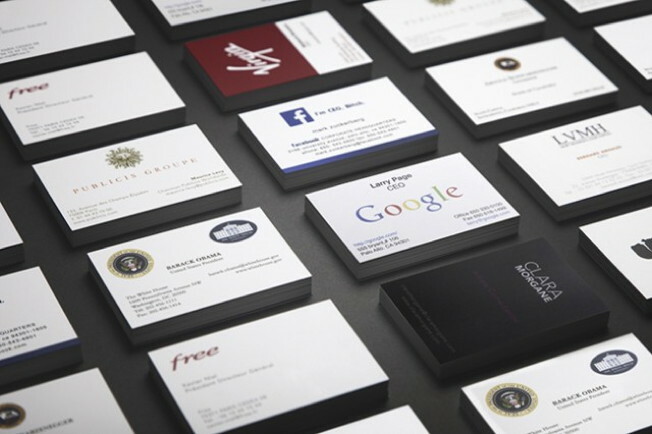 This isn't the first time Gloryparis used the social capital of better-known people to rise above noise: In January, it revealed the designs of its business cards, which feature basic Gloryparis contact details on one side, but, when flipped, reveal the actual business card and contact details of somebody famous—Mark Zuckerberg, say, or Barack Obama. This is some mouthy and cool stuff (especially if you don't need an agency but could really use Larry Page's email), but it's also tricky territory: Less than a year into its life, Gloryparis is building a rep based more on how it markets itself than on how it markets others (so far, there's just been one client case study: Its work for Humanoïde magazine). And its style of daring, while catnip for ad pubs, may worry clients, who may see themselves as colleagues of guys like Zuck and Larry Page. We'll see what they're all about in a year.